Built by early settler Aslag Anderson 150 years ago at the bottom of our hill here in Ephraim, this buildings have served me as subject matter for innumerable paintings and drawings over some forty-years. 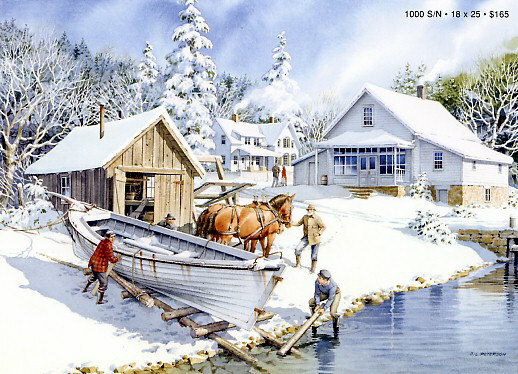 leaving his store as villagers haul ashore for winter storage a fine sailboat, the great Mackinaw type fishing boat. Published primarily for Charles Peterson's local market with only a portion of this edition being made available for national distribution. This is a NON-Memories (Non - Ghost) image.
" November at Anderson's Dock "
1000 signed and numbered 18" x 25"
" November at Anderson's Deck "